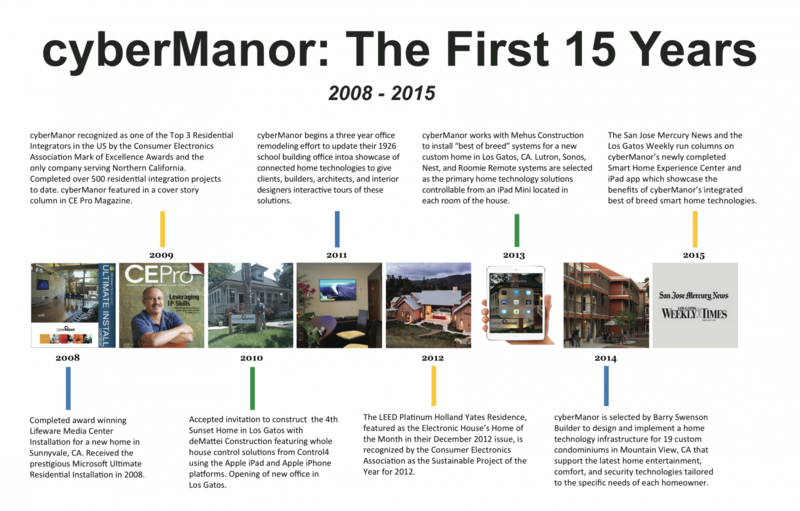 cyberManor was founded in Los Gatos, California in 1999 by Gordon van Zuiden – one of the first residential custom integrators in the United States focused on installing and supporting networking technologies in the home. cyberManor was originally founded to connect PC and Apple computers on one wired network to share the newly introduced “always on” high speed cable and DSL internet services. This networked computer system for the home was a major improvement over the previous dial up modem experience that was much slower and could only be used by only one person at one computer at a time. 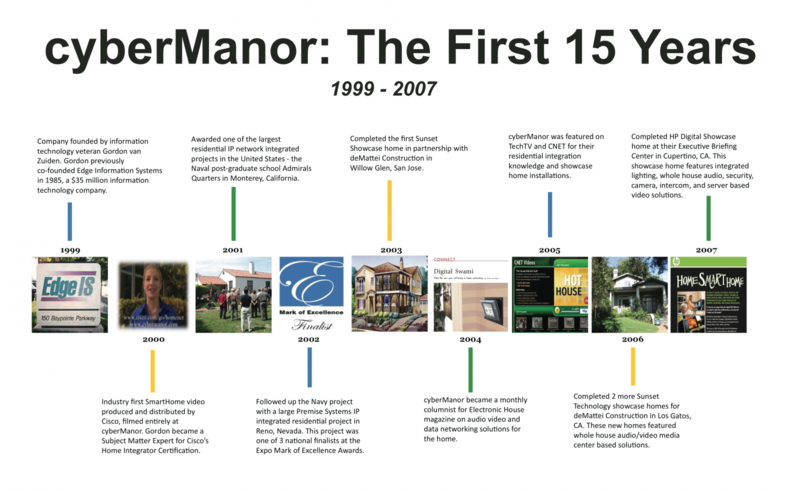 In the early years cyberManor focused on providing robust home data network solutions for their residential clients, but over time the company’s expertise extended into providing digitally based audio, video, and control solutions for the entire home. Over the last 20 years cyberManor’s home technology solutions have been featured in four different Sunset Showcase Homes, HP’s Digital Demonstration Home at their Cupertino campus, Electronic House Magazine’s Home of the Month – America’s Greenest Home, Microsoft’s National Ultimate Installation award, the San Jose Mercury News and in videos produced by Cisco and CNET. cyberManor has worked with many prestigious home builders, architects, and interior designers in the San Francisco Bay Area to best integrate cyberManor’s home technology solutions into the design and aesthetic needs of their clients. Mr. van Zuiden is a recognized columnist and speaker at home technology events around the United States and abroad. His white papers on home technology have been published on TiVo’s custom integration portal, the CEDIA national trade association website, and several industry trade magazines. cyberManor published their first Smart Home Magazine based on their first hand experience as a custom electronics integrator at the end of 2015. 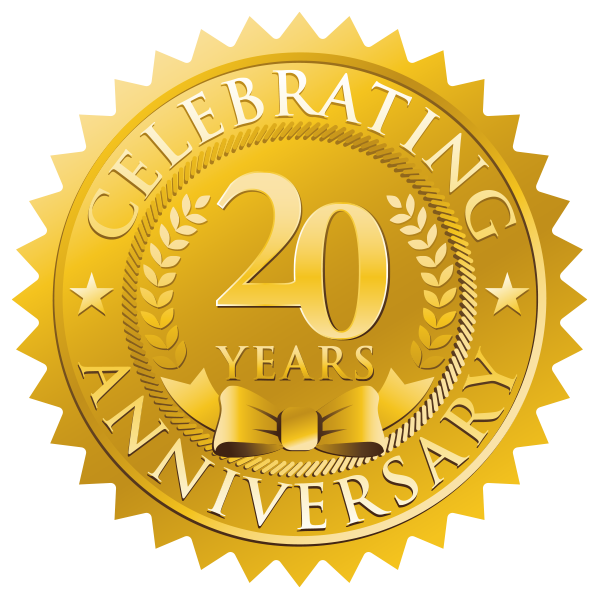 Today cyberManor has installed digital home technology solutions for over 1000 homeowners in the San Francisco Bay Area.